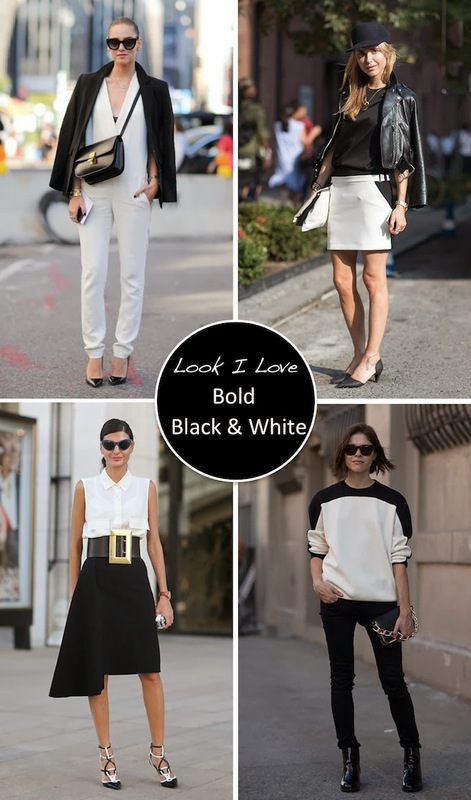 Bold black and white color blocking looks anything but basic when outfits play with textures and proportions. I'm not sure about you, but monochrome color trend that my closet can easily join. From white hot to sophisticated ecru tones, it is time to play with light against dark. From the streets of New York to Milan, style bloggers and fashion editors rocked black and white at the Spring 2014 shows. This classic color combo looks fresh when accessories are kept entirely black and white as well, and better yet, when they are both black and white. You've seen correctly! White shoes after Labor Day are OK, especially when done in a closed toe pump or bootie. For a modern way to wear head to toe color, a jumpsuit is the answer. If you would like to add a little edge to subdued ecru look, throw on a black leather biker jacket. More daring fashion darlings like Miroslava Duma know black and white lends itself to proportion play. Try using these colors to explore new silhouettes for your closet such as midi skirts. I've scoured the net for the best and boldest items to conquer a black and white look. Scroll through to shop my finds. Oooh! we couldnt agree more! Black and White is so classic and clean! So perfect! This is my absolute favorite color combo. One word = Classic. My favourite color combo ever! Such a classic color combination, love! You really can't go wrong with black and white together! Awesome take on the concept of Black & White, seen a lot myself during Milan Fashion Week, and no amount of monochrome could ever be enough!